These withholding periods only apply if you are selling livestock or harvesting crop that has been sprayed for locust. If livestock are retained on farm, withholding periods do not apply. When spraying locusts, consideration must be given to the value of pastures and crops in the context of the whole farm. This includes the number of livestock, available feed supplies and feed requirements, the cost of replacement feed, if stock have to be sold and the cost of locust control. Established green crops tend to be avoided by hoppers (although the edges of crops can be damaged). 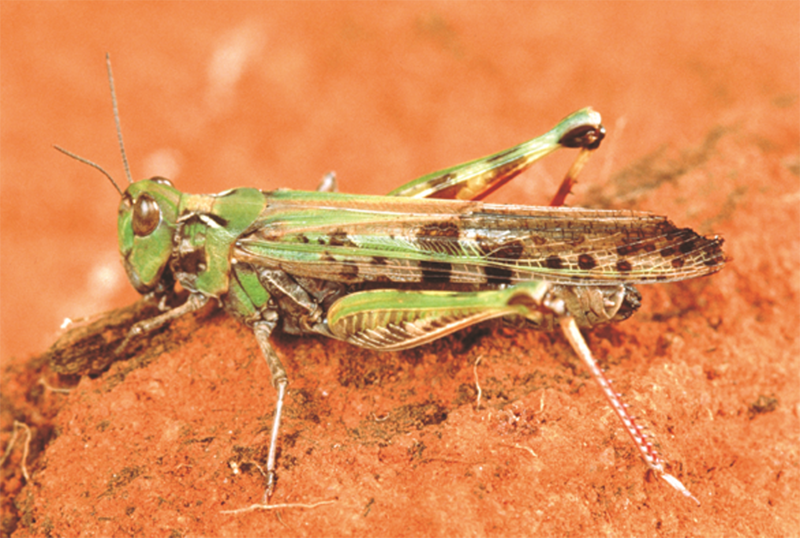 Crops that are beginning to dry off when locusts begin to ﬂy are especially susceptible to damage. Hopper and adult locust numbers should be closely monitored, and if any damage is seen, then spraying should start immediately. To prevent unacceptable residues of chemicals in livestock at the time of sale be aware of the withholding periods (WHP) and export intervals (EAFI, ESI, EGI). Use the Witholding period tables to select the insecticide best suited for your enterprise. Label withholding periods only apply to domestic markets. EAFIs, ESIs and EGIs do not appear on the product label. Organophosphorus and carbamate insecticides break down relatively quickly while the synthetic pyrethroid insecticides can persist on pastures and crops for relatively long periods, particularly on drying or dry pastures and crops. The synthetic pyrethroid esfenvalerate is an exception and does not persist on dry pasture. If livestock have been exposed to insecticides within 60 days of selling, answer yes to question 7 on the cattle National Vendor Declaration (NVD), or yes to question 5 on the sheep NVD. Complete the details of the chemicals used as required (except for synthetic pyrethoids used on drying pasture where the 60 day period commences after the next break of season). What are the withholding periods? What are the main risks or dangers that growers need to be wary of? What can growers do to avoid chemical residues impeding their ability to sell stock?